(****) Thailand holds bilateral agreements on visa exemption for holders of diplomatic, official and ordinary passports for a visit of not exceeding 90 days with Brazil, the Republic of Korea and Peru. Therefore, nationals of these 3 countries are exempted from visa requirements and are permitted to enter and stay in Thailand for a period of not exceeding 90 days. II. List of countries which have concluded agreements on the exemption of visa requirements for holders of ordinary passports with Thailand and permitted to stay for a period of not exceeding 14, 30 and 90 days. (***) According to the Agreements on Exemption of Visa Requirements between Thailand and Hong Kong SAR and between Thailand and Macau SAR, all types of Thai passports including diplomatic and offcial passports shall be exempted from visa requirements for a visit of not exceeding 30 days to Hong Kong SAR and Macau SAR. NB : Nationals of countries which hold Agreements on Visa Exemption Requirements with Thailand intending to work or stay in Thailand beyond the agreed bilateral arrangement must apply for an appropriate visa before entry into Thailand in order to submit the application for work or stay permit. Visitors who enter the Kingdom with Visa on Arrival generally cannot file an application for extension of stay except in special cases such as illness which prevents them from travelling, etc. They can submit an application at the Office of Immigration Bureau, Immigration Division 1, Government Center B, Chaengwattana Soi 7, Laksi, Bangkok 10210. Tel 0-2141-9889 or at website http://www.immigration.go.th. Bangkok is served by two international airports: the main airport, named Suvarnabhumi Airport (IATA Code: BKK), located about 20 km. to the east, and Don Mueang International Airport (IATA Code: DMK), located about 20 km. to the north of Bangkok. 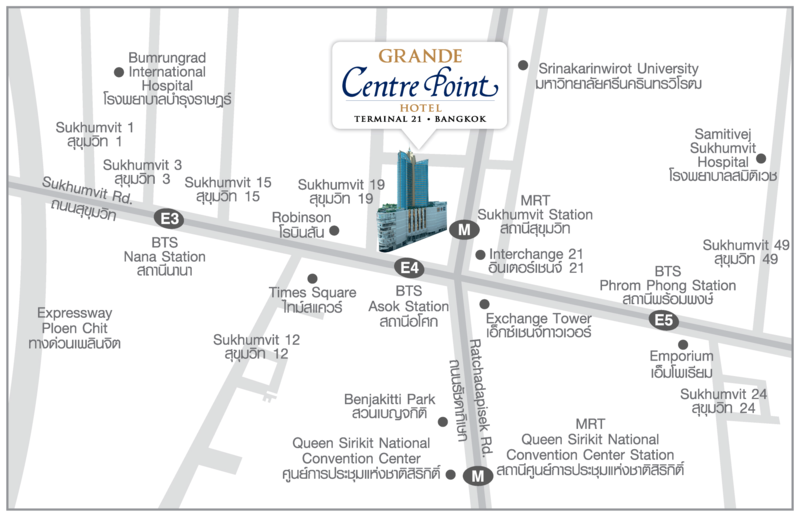 The venue of the conference is at the Grande Centre Point Hotel Terminal 21, a luxurious hotel conveniently located at the junction between Sukhumvit Road and Ratchadapisek Road in the central business district of Bangkok.